My brain is still on halidays, so are all parts of the body. The mind knows that there is dinner to be served, but the body is not leaving the warm comfy couch. Finally, i yanked myself up from the couch and went straight to the freezer, found some pork chops and decided to cook something fast. 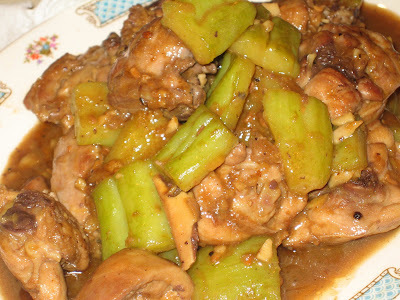 This dish, although fast to prepare, is very delicious with white rice. Heat the wok and add in 1 tbsp of oil. When oil is shimmering, add in the diced pork and sprinkle with a little salt and pepper. Flip pork when it is brown on bottom, then brown the other side. Remove pork and leave aside. Add in the remaining oil and spicy fermented bean sauce. Saute until fragrant, the add the garlic, ginger and the fried pork. Bitter gourd (Latin Momordica charantia) is also called Balsam pear or bitter melon. Bitter gourd contains vitamin A, B1, B2, and C. It also contains minerals like calcium, phosphorous, iron, copper and potassium. From the ayurvedic perspective, bitter gourd is excellent for balancing Kapha. It helps purify blood tissue, enhances digestion, and stimulates the liver. Definitely an acquired taste, many do not like it cos of the bitterness but those who like it, say that it is 'kum' in cantonese - a special sweetness. Cut bitter gourd in half lengthwise and scrape out the seeds with a sharp spoon or corer and discard. In bowl, combine and mash black beans , ginger,shallots,garlic, brown sugar, black soy sauce and chicken stock; stir; reserve for 15 minutes. Heat wok with 1 tbsp oil and when oil is very hot, add chicken. Stir-fry for about 3 minutes on high heat - or until chicken begins to shrink and firm up. Remove chicken to holding bowl. Reheat wok to high, add remaining oil. When oil is hot, add black bean sauce. Stir-fry until fragrant and aromatic. Add bitter gourd, and saute. When sauce boils, add cooked chicken; toss to combine. Cover the wok and cook until chicken is tender. Dribble in a little cornstarch paste if needed; cornstarch in chicken marinade might be enough. Toss ingredients until sauce thickens. 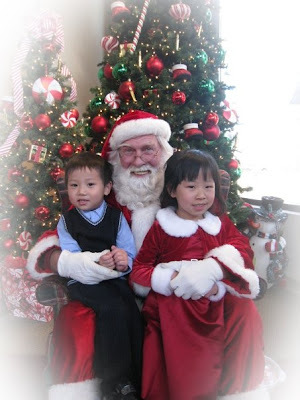 Time flies, Christmas is over and 2008 has only 3 more days left. The Chinese New Year is creeping on us fast next year, it will be January, 26th, so less than 30 days to prepare all the goodies. These snacks are so mini and tedious to prepare that thank goodness, the CNY is only once a year. This is a buddy project, so gather all your buddies and have a good time with them while making them. Cut one spring roll skin into 9 equal squares. Place some floss on to each square, enclose and wrap like spring roll. Heat oil in a wok; fry rolls till golden brown. Remove from oil onto baking rack which has kitchen towel at the bottom to catch excess oil. 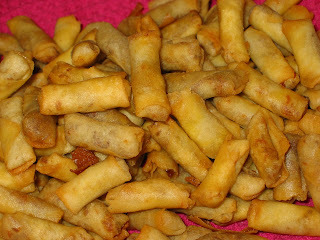 Put fried rolls in to bake at a preheated oven 350f for 5 or 10 minutes, so that the rolls are thoroughly cooked through and excess oil will be removed. Let cool completely and store in air tight container. I love salted fish cooked this way especially if the flesh of the spanish mackeral is soft and powdery - the cantonese way to describe this texture is 'MUI HEONG". MUI - means can be torn easily - that is if it is a piece of cloth but for the fish - MUI means melts in the mouth. HEONG - Fragrant to those who have acquired a taste for it. Unfortunately, this salted fish bought in the Korean Store, is very different from the salted MUI HEONG from Malaysia. The flesh is not salty and it is firm. Anyway, it made a very good accompaniment to plain rice or congee. 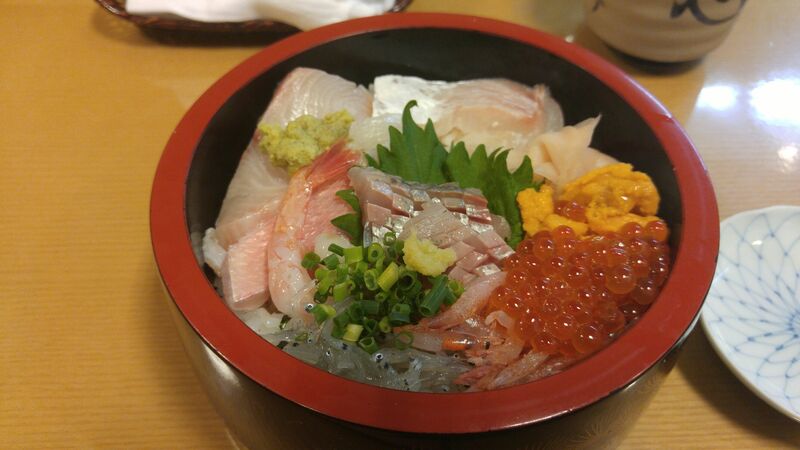 Place fish on a dish which can fit the rice cooker. Put ginger slices on top of fish and pour oil over. Place dish on top of the rice when no more big bubbles are visible. Close the lid of rice cooker and let fish and rice to complete cooking. When the rice is ready, the fish should be cooked too. Steaming meat dishes is one of my favorite ways of cooking, cos, not only is it healthy, it is so fast to prepare. This dish gets cooked when the rice is ready. Marinate the chopped chicken pieces with the marinate for 20 - 30 minutes in a deep dish that can fit into the rice cooker. 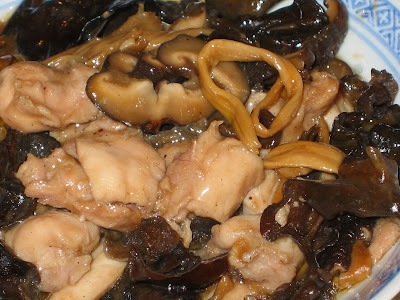 Mix the sliced mushrooms, cloud ear and lily buds into the marinated chicken and drizzle with fragrant oil. 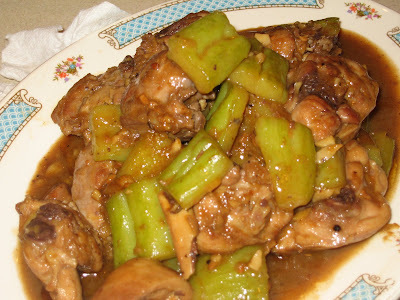 Place the dish of chicken on top of rice in rice cooker, when big bubbles are no more visible on the rice surface. Close lid tight. The chicken will be cooked when the rice is ready for serving. You would say that i am not doing justice to this fine textured fish by pan frying it but i would not no, cos the flesh is just as delicious fried this way. To serve steamed fish is quite difficult here, especially winter, food gets cold so fast and every member of the family has to present and ready to eat, then only can the steamed fish be served. Coat the salted fish with the tapioca starch/cornstarch. Heat wok and add in oil, only when the wok is shimmering hot. Lower the fish into the oil carefully to avoid splatterings. Fry until golden brown before flipping and fry the other side of fish until golden brown too. Remove fish and place on serving plate. Remove all the oil except 2 tbsps oil. Fry the julienned ginger until crispy. Remove and put them on top of the fish. Add soya sauce and sugar to the oil in the wok and cook until it thickens. Spoon over the fish and serve hot with white rice. This rich almond tart is always a perfect dessert to be served after Christmas Dinner. This is super darn tasty!! It has a strong almond flavor but it is also delicate and lovely. The best part is, it is relatively easy to bake, looks impressive and and tastes delicious without being overwhelming. Roll out puff pastry on a lightly floured surface. Lay in ungreased tart pan and gently push dough into sides. Roll across top with rolling pin to cut off excess. Place pan on baking sheet. Add Almond Paste, sugar and butter to a mixing bowl. Beat on low speed to incorporate. Beat on high for 2 minutes. Add eggs one at a time, beating after each. Beat on high for 3 minutes and pour batter into tart shell. Drain pears. Place pears cut side down on a cutting board. Make 4 length-wise diagonal slices, about 1/8" from top of pear through the bottom, so pear slices will fan out. 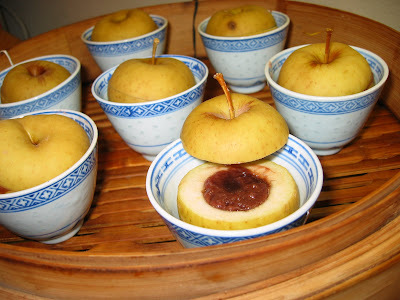 Place pears close to edge of tart, and arrange decoratively on batter and bake for 45 minutes or until firm. 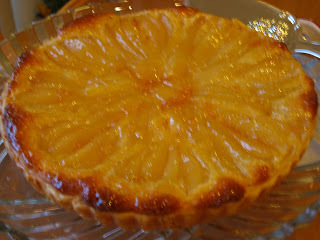 Save any remaining pears for serving with cooked tart. Tent with a piece of aluminum foil if tart is browning too quickly. Tart is done when a toothpick inserted in middle comes out clean. Rest tart on wire rack for 10 minutes then unmold. This huge pumpkin has been sitting around in my kitchen since Halloween and i finally dissected it. Half of it was cooked in the microwave and then kept in 1 cup portion, the other half was shredded and also portioned into 1 cup. They are in the freezer for future recipes. This bengka was so flavorful and rich with the addition of grated pumpkin. The taste was unbelievable, it was like eating 'kaya'. Lining the baking tray with banana leaves made the bengka more fragrant. Lightly grease a 23cm square tray with margarine and line with banana leaf. Mix all the ingredients in a large glass bowl well to combine. Microwave on high 2 mins, stir well and microwave for 1 min at a time until mixture has thickened. Pour into prepared tray and bake in preheated oven at 375f for 40 - 50 minutes or until it is firm. Brush the top with butter, coconut cream or oil and broil until golden and the crust is browned and aromatic. Traditionally, the Dongzhi Festival is also a time for the family to get together. One activity that occurs during these get togethers (especially in the southern parts of China and in Chinese communities overseas) is the making and eating of Tangyuan (湯圓, Cantonese jyutping: tong1 jyun2; Mandarin Pinyin: Tāng Yuán) or balls of glutinuous rice, which symbolize reunion. " According to what i have been told since i was a child that we must take these 'tong yuen' so that we will be a year older. I have not ate these balls for quite a while, no wonder I am not getting older - ha ha - how i wish. Once the dough is pliable, separate them into small portions and add food colourings. Roll dough into tiny consistent size balls. Bring a large pot of water to the boil and drop in the balls. Once they float, they are cooked. Prepare a big bowl of room temperature water that has been boiled. Scoop the tang yuan from the pot and put them in the bowl of water. Cook rock sugar, ginger slices , pandan leaves and water to make a sweet syrup. Cool syrup before adding in the cooked balls. A completely traditional Mexican Chile Verde is a green chile stew without any tomatoes at all; however, in practice it is far more common to include some tomatoes ... some "green" chilis use so many the color becomes red and the flavor becomes heavily tomato. This recipe has just a small can of tomatoes, to lend the richer, smoother flavor they impart, but not so many to adulterate the green chile character. The flavor of green chili is influenced most by the kind of green chiles you decide to use and i use all fresh jalapenos. There is no reason to limit yourself to jalapenos, if you enjoy experimentation, try cooking with any chille, it's similar to choosing what variety of apples you prefer - i have tried with canned pickled green chille and they turned out spicy and delicious too. In skillet, heat oil over medium-high heat. Saute pork until all pink is gone (about 5 minutes). Add garlic and onion. As soon as garlic sizzles, stir in the flour. 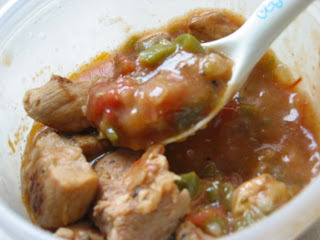 Cook until flour is cooked, then add in the pork, chopped jalapenos, tomatoes , cumin and chicken broth. Transfer to a crockpot and cook on high. When the mixture boils, turn to low and cook until chille is thick and the texture you want - cooking time depends on your crockpot, i like to stew it for at least 2 hours. Serve over plain or mexican rice, burritos, chile rellenos, chimichangas, etc. This is the time of the year for bonding and how wonderful it was, 3 generations in the warm kitchen, on a snow day, making and decorating gingerbread bear. Divide dough in thirds; wrap each third in plastic. Chill for at least 1 hour or overnight. Before rolling out, let sit at room temperature for 5-10 minutes. If after refrigerating the dough feels too soft to roll-out, work in a little more flour. Place a dough third on a large piece of lightly floured parchment paper or wax paper. Using a rolling pin, roll dough 1/8 inch thick. Refrigerate again for 5-10 minutes to make it easier to cut out the cookies. Use either a cookie cutter or place a stencil over the dough and use a knife to cut into desired shapes. Bake until crisp but not darkened, 8 to 10 minutes. Remove from oven. Let sit a few minutes and then use a metal spatula to transfer cookies to a wire rack to cool completely. Makes 16 5-inch long cookies. The traditional way to make Royal Icing is to beat egg whites and lemon juice together, adding the powdered sugar until the mixture holds stiff peaks. With modern concerns about salmonella from raw eggs, you can either use powdered egg whites or heat the egg whites first to kill any bacteria. With the heating method, mix the egg white and lemon juice with a third of the sugar, heat in a microwave until the mixture's temperature is 160°F. Then remove from microwave, and beat in the remaining sugar until stiff peaks form. Using the powdered egg whites method, combine 1 Tbsp egg white powder with 2 Tbsp water. Proceed as you would otherwise. If the icing is too runny, add more powdered sugar until you get the desired consistency. Keep the icing covered while you work with it or it will dry out. Last year i made Christmas Stollen and this year decided to try Panettone. The ingredients are pretty much the same, it is just the shape that determines the name of these bread. The significant difference is, Christmas Stollen is German and Panettone is Italian. Combine all ingredients for the starter and leave it to ferment for 12 - 16 hours. Put all the main ingredients into the bread machine pan following the order as stated. Press the dough function and let the bread machine do the mixing and kneading and at the first beep, add in the fruits. Continue to complete the dough function. Divide dough into desired weights and put them into appropriately sized pan or muffin cups. Place them on a baking sheet and place baking sheet into a large trash bag to proof until double the size. Bake in preheated oven at 375f for 20 minutes or till golden brown. Everytime i cook this dish, it reminded me of my adopted sister cos her name sounded like what we would call her. The chinese likes to doublely call your first name - her first name is 'la' so it became 'la la' which is also the same tone for 'clams'. You think 'la la' is funny, wait till you hear this. Heat 2 tbsp oil and saute dried prawns until fragrant. Add in curry leaves, shallots, chilli padi and stir-fry until aromatic. Add in the clams/la la, seasonings and stir fry at high heat until well mixed. Cover with a lid, cook for 2 minutes until clams/la la are opened. Thicken with corn flour and water, mix well and dish up. I grew up with Marmite. My mom would make soup or add it to congee or rice and it was the best, there was no need for any other dishes or sides, just a tiny spoonful of Marmite. Heat oil and add in chicken pieces to brown. Sprinkle salt and pepper and turn chicken when it is browned on one side. Brown the other side. Add in the sauce ingredients and cook until sauce has thickened. This recipe is from Marcy Goldman's - A Passion for Baking and she described these cookies as gem which are big, soft and pillowy old-fashioned affairs. I have made them smaller than what was called for in the recipe. Yes, these cookies are sort of like a mini pumpkin cake which is nicely spiced and gorgeous in color. Like any other american cookie, a sugar glaze is smeared or drizzled on, but then, it's me again, who does not like the sugar glaze for the added calories, did not have glaze for my mini cookies. Water, as required to make soft icing consistency or glaze that holds. Preheat oven to 350 f. Stack two baking sheets together and line top sheet with parchment paper or with silicone silpat. In a mixer bowl, cream both sugars and butter(or shortening) until fluffy. Add egg, vanilla, and pumpkin puree and blend well. Fold in flour, baking powder, baking soda, salt, pumpkin pie spice, and cinnamon and, when almost blended. fold in raisins. Bake for 15 - 17 minutes (12 = 15 minutes for the minis) until cookies are firm. Cool well on wire racks before icing. In a small bowl, whisk together Icing ingredients to make a smooth glaze. Smear or drizzle over almost totally cooled cookies and let set. These tiny green granny smith apples came from a friend who has a tree. They were so tiny and cute and they fitted these chinese tea cups perfectly. The taste was unbelievable, imagine a tangy and sweet red bean paste acting together to give a lip-smacking dessert. Cut the tops of an apple and core the center. Fill the cored center with red bean paste and place the top back. Put into a chinese tea cup. Repeat with the rest of the apples and steam on high heat for 30 minutes. Serve hot as a hot dessert after a chinese dinner. These are one of the all-time great appetizers which can also be served as hors d'oeuvre. Not only are they pretty to look at, they are sumptously delicious. 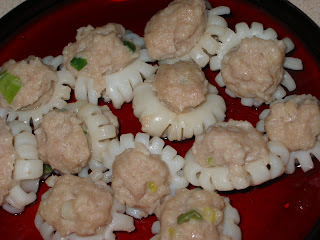 i have included them in my Dim Sum List and also as a special item for Steamboat. Cut the squid into 1 inch rings and cut 1/2 inch slits to one edge of the ring. Chop the shrimp and ground pork until a very fine texture. Add in soya sauce, fish sauce, pepper, sesame oil and sugar. Mix in thoroughly. Add water to the cornstarch/tapioca starch and salt. Stir to dissolve the salt. Add cornstarch mixture to the shrimp and pork and stir vigorously to make a paste. Dust the inside of the squid ring with cornstarch/tapioca starch. Fill the squid ring from the top which is the unslit side. Put filled squid onto a greased plate and steam on high heat until cooked. If serving as a dish, make a sauce with the juice from steaming and thicken the juice with a cornstarch/tapioca solution and a dash of shao=xing wine. These muffins waft the most incredible aroma as they bake. This recipe makes tiny, not-too-sweet, pop-in-the-mouth mini muffins that are somewhere between a muffin and a cake in texture. The final product is a delectable little morsel that is totally luscious. Mix the dry ingredients - flour, baking powder, baking soda, salt, pumpkin spice and cinnamon. Mix the wet ingredients - sugar, pumpkin, oil and eggs, beat lightly. Pour wet ingredients into dry ingredients and fold in until all the dry ingredients are well blended. Using an ice-cream scoop, scoop batter into prepared mini muffin cups, filling each 3/4 full. Bake in preheated oven 350 F for 17 - 20 minutes or until muffins spring back when gently pressed with fingertips. As promised, more pumpkin recipe. This time it is making bread with pumpkin. It is so rewarding, the bread is soft with the most beautiful tinge of yellow. To have a more evenly brown top, make sure the dough is rolled as even as possible, unlike mine, some were taller, so they were more brown. Put the ingredients acording to the order in the Bread Machine bowl. Select the dough function and press 'start'. Let the machine churn and using a spatula, aid the loose flour to be churned up by the machine. Add a tbsp of water at a time so that all the loose flour is no more visible. As soon as a dough is formed (My breadman will rest for 20 mins, for other machines, press pause and let dough rest for 20 mins). The machine will beep when dough is ready. Roll out the dough to a thickness of 2cm. Divide the dough into small pieces with a round cookie cutter. Try to divide the dough as even as possible, so that the bread won’t come out some part burnt while other part are not even cooked. Arrange them in tube pan. Brush the top with egg glaze and rest for about 15 - 30 minutes. Preheat an oven to 180C/350F. Put 3 cups of flour in a big mixing bowl, make a well in the center and pour 1 cup hot water into it. Using a wooden spoon or a chinese rolling pin, stir to mix and add in the room temperature water a little at a time, until no more loose flour is visible and a dough is formed. Cover dough with a damp towel and leave to rest for 20 minutes. After 20 minutes, knead dough until smooth and elastic. Leave dough covered to rest again for another 30 minutes. After resting, flour the pastry board and roll out the dough as thinly as possible. Spread softened shortening onto the rolled dough and sprinkle generously with salt, then the scallions. Roll the dough up into a swiss roll. Using your palm as a guide, pinch off a piece of rolled dough, the size of your palm and then pinch the ends to seal. Place one end on your palm, and press down the other end to make a disk. Line this disk to rest and proceed with the next piece. you should have 10 pieces or more if your palm is smaller. Heat a frying pan with a little oil on medium high heat. Drop a piece of pancake in and as soon as the pancake gets set, flip it over. Fry until it is golden brown. When pancake is done, using a chinese rolling pin, hold the pancake down about 1 - 2 inches from the edge, then using a spatula, push in the edge of pancake to the rolling pin. This will break up the pancake and makes it flaky. you could divide down into 10 portions and roll 1 portion at a time, spread with shortening, salt and scallions.